The Mervis IDE work project is called a solution. 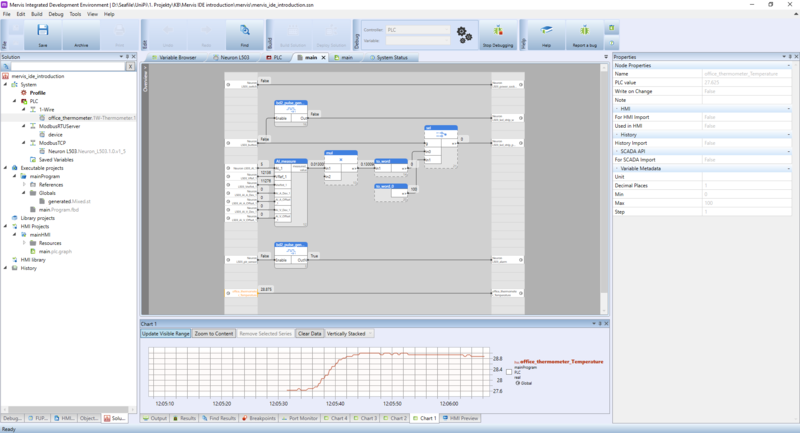 The solution consists of connection parameters to your PLCs, their configuration, programs, libraries and HMI interfaces. In the Left panel, you can see expanded tree for PLC, showing a list of configured communication channels (1-Wire, Modbus) and connected devices. In the Executable Projects you will have all your programs and function libraries. In the HMI Projects you can see a list of HMI windows. In the Main window, you can see a FBD program under the debugging mode. The left column of the programming canvas contains inputs of the program. In the middle section, you can place function blocks (FBs), which enclose a certain functionality. The right column contains outputs of the program. As stated above, the program is in the debugging mode, which allows us to check the current values of inputs, outputs and variables in the PLC. Those values are shown in small grey boxes right next to the output. The debugging mode also allows you to chart the actual values, as you can see in the section under the Main window. The Properties panel on the right contains a complete list of all properties for selected object. Right now, it shows parameters for office_thermometer_temperature input. On the next screenshot, you can see a the HMI building interface. 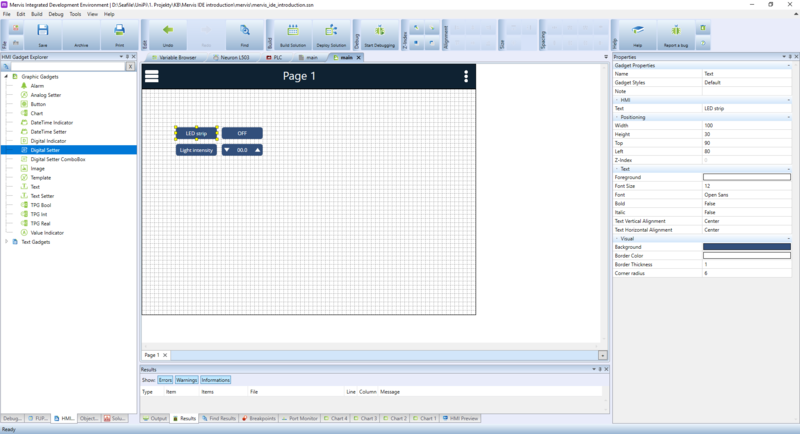 In the Left panel, you can see a list of graphical elements, you can use for building your interface. The Main window shows a canvas for the actual HMI interface. In the Properties panel you can see properties of the selected text element.